West Ham and Crystal Palace are the week’s Power Rankings winners after beating Liverpool and Chelsea, who are joint bottom overall with Spurs. In Power Rankings, we award points from 0.5 up to 10 decided by an algorithm based on bookmaker odds and winning margins. Manchester United, for example, have got seven points in the actual Premier League table, but they were odds-on favourites to beat Tottenham and Aston Villa yet won by only a goal – and were odds-on against Newcastle, when they were held. It earned them a point in reality, but the Power Rankings highlight the fact that Louis van Gaal’s side will actually rue two dropped points. At the other end of the scale, despite West Ham being top, the Power Rankings can be used to highlight their dropped points – they have claimed two wins that few other teams will manage yet are only in mid-table after slipping up in games they were expected to win. For them, it’s a case of ‘if only’. 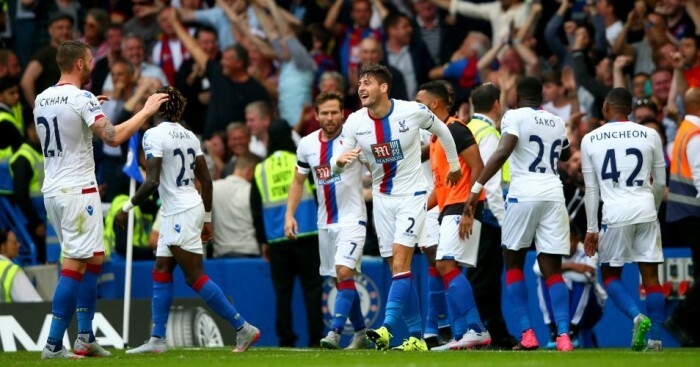 Crystal Palace – 10: Near 10/1 shots to win at Stamford Bridge, Palace did exactly that as the Premier League champions suffered another early-season blow. West Ham – 10: They weren’t quite so unfancied going into their game at Liverpool, but a three-goal winning margin also sees West Ham also claim maximum points. After winning at Arsenal on the opening day, they have claimed two of the three 10-point hauls awarded so far. Southampton – 4: They were odds-on favourites to beat Norwich, but Steven Whittaker’s sending-off aided Saints as they racked up bonus points in a 3-0 win. Swansea – 4: It may appear harsh, but Swansea also only claim four points having edged their way past Manchester United at just short of 3/1 with the bookies. West Brom – 4: Claiming four points earlier in the weekend were West Brom after two red cards helped Tony Pulis’ side to what was deemed an unlikely win at Stoke. Manchester City – 3: A comfortable home win over Watford earned City another three points, but the exploits of West Ham and Palace sees Manuel Pellegrini’s side surrender top spot – for now, at least. Arsenal – 2: Odds-on favourites to win at Newcastle, Arsenal failed to claim any bonus points having scraped only a 1-0 win in the North East. Everton – 2: Roberto Martinez’s Everton, however, gain a point courtesy of a draw against the odds at well-fancied Tottenham. Sunderland – 2: Another team gaining a point were Sunderland, who were 19/5 outsiders going into their game at Aston Villa. Bournemouth – 1: A draw against Leicester at Dean Court earns Bournemouth a point, exactly as it did in reality. Leicester – 1: The visitors also claim a point to stay just ahead of their actual tally for the season. Tottenham – 1: Everton gained an extra point for the draw at White Hart Lane, but Spurs were favourites and so have to make do with one. Aston Villa – 0.5: Villa, meanwhile, claim only half a point having been strong favourites to see off Sunderland at Villa Park.